The Sinai Peninsula sits like a wedge between the African and the Asian continent. The Sinai is divided by two gulf streams, the Suez Canal in the west and Gulf of Aqaba in the East. Towards the North the peninsula reaches into the Mediterranean Sea. 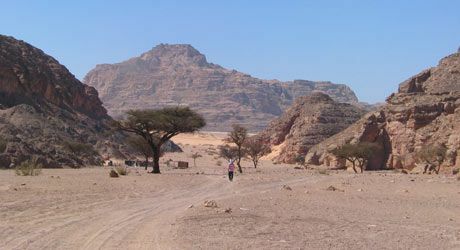 The entire Sinai Peninsula is a wild mountain range in the desert, with peaks ranging from 750m to 2500m above sea level. The various colours of the sedimentary levels tell story upon story of the 1000 years of history in its austere beauty. The desert as well as the ocean are the two predominant elements of the Sinai, with the mountains meeting the waters of the Red Sea with its crystal clear water and largely intact marine flora and fauna rich in species.